Howard & Jason Krew, our west coast O.E.M. 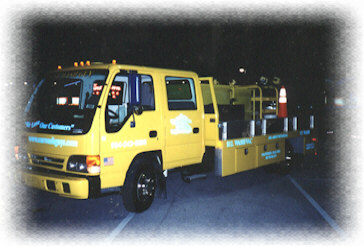 vendor for WashGuy units, delivers the newest unit to our Tallahassee, FL. franchisee. 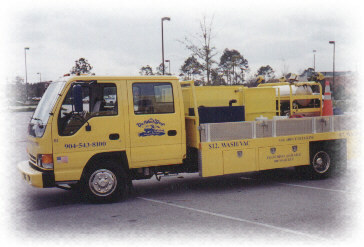 This unit is one of the nicest looking yellow wash trucks ever produced in North America. Howard and his son Jason have been in the cleaning equipment business for over 35 years. AAA pressure washing ( www.aaapws.com ) has been an official Car Wash Guys vendor for 5 years. This is version 5.0 of the Millennium "Wash All" unit. These trucks have been produced in Denver, Houston and Phoenix. Over the past 2 years we have purchased trucks for these units in 11 states from Isuzu. Notice the outstanding workmanship. 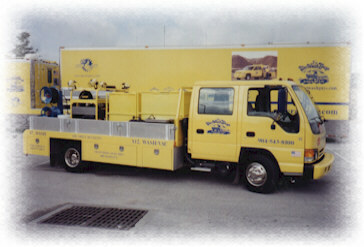 Once this truck hit the road on Florida's First Coast. Life was not the same for our competitors in the area. 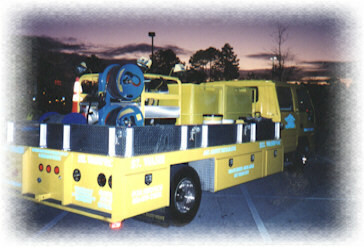 Pictured here is the first J-Ville truck for 2002 even after the sun sets, the work is never done. There is just no stopping these new units. We believe that the image we reflect is by far the most important thing to concentrate on, after all people are trusting their cars with us. Certainly when people see the immaculate and powerful presence this truck emanates we will turn them into WashGuy customers, because it is quite obvious that we are the best and will do a better job.